The Covenant Culture is Schoenstatt’s answer to the question posed by the Church and by society: Schoenstatt, what do you do? The Schoenstatt Movement has been responsible for the birth of many apostolic, social, educational, missionary and pastoral activities throughout the world. It is about the dynamic power of the Covenant of Love, a Covenant Culture in all aspects of life. With concrete manifestations of the Covenant Culture, Schoenstatt shows – through deeds – its love for the Church, for families, for youth, for the poor and needy, for society in its political and pedagogical aspects; for a world of development and investigation and for all aspects that have something to do with people and the longing to live in covenant with God, with their neighbours, with nature and work, and with themselves. This is the concrete contribution that Schoenstatt offers for the development of a new social order, the realization of its call to build a new world, from the Covenant of Love, and through new persons. The Covenant Culture is, moreover, an offer from Schoenstatt for the Church and society. In the same way that poverty wasn´t meant for the Franciscans alone, neither the discernment of spirits only for the Jesuits, peace only for St. Egidio and unity just for Focolare, the Covenant Culture is by no means, only for Schoenstatters. Hence, the “tents” for the jubilee have some kind of an internal dialogue as well as an external sign of our times, about the challenges of modern man, being this a dialogue that springs forth from facts. They show real life, and not only from a theoretical speculation. This gives it more strength and conviction. Many of these initiatives were started by people or by groups from a particular branch of the Movement, or they have been the fruit of a calling or an inspiration from the Blessed Mother or the Shrine. These are people who have been opened to Blessed Mother and the mission of the Shrine have established systematic and ongoing social initiatives that make a difference to the lives of those who need it most. These projects, initiatives or institutions work daily to embody the spirit and the pedagogy of Schoenstatt. In their daily work, they apply the pedagogical concepts of Father Kentenich and apply all material and human tools to work towards human dignity. Therefore, each project has a “missionary” and evangelizing aspect in itself, and at the heart of its mission is the aim to lead all those who suffer to God and to share with them the message of Christian love. There are many different kinds of social, pastoral, pedagogical and missionary projects that have been born out of the Covenant of Love, which are not only a reflection of the varied needs experienced by modern man, but many of these also originated from the “encounter” with personal vocations and concrete situations that must be translated into actions. The fact that these initiatives encompass other areas shows that they have been the fruit of an organic focus. For the great celebration in 2014, many will have the opportunity to show their projects in tents according to their category and which show the Covenant Culture. The International Communications Office 2014 wants to anticipate the joy of the lived Covenant of love by creating “Virtual tents” in which many of the initiatives that apply Fr. Kentenich’s spirituality and pedagogy can be known. These projects touch life and make the Covenant Culture concrete in daily life. 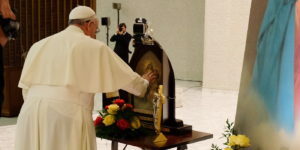 The Campaign, as Schoenstatt’s ‘missionary countenance,’ is present all of the strategic areas of the apostolate, and wants to reach out to all men and women, especially families so that their homes can become shrines where Mary can educate and evangelize. In particular, João Pozzobon reached out to children and the poorest of the poor, and wanted the Campaign to work towards “salvation of families” (Testament). Here we see a strategic pastoral accent. From the Shrine to the poor: the social commitment of the Campaign has its origins in João Pozzobon himself, in the commitment and mark of his actions.